"One of the world's tallest student towers..."
To give context the tallest student apartment tower underway will be Melbourne's 60 storey, 195m tall Scape. There's a myriad of student towers in the 150-170m mark, so I'd say there's a fair bit of creative licence in that line from the journalist. Scape has multiple projects in Melbourne. The recently completed (I presume) 146m/46l tower on Swanston St has this project's measure. Their new project is put at 199m on SSC but hasn't started construction yet. This fairfax article from 9 months ago has the Student One tower in Brisbane as the tallest student block in the world at 41 levels. In the UK, Leeds has the 37l Sky Tower dubbed the second tallest in the world. Manchester has 37l/109m Liberty Heights which was dubbed the world's tallest in 2012. Which buildings do you have in the 150/170 range? Check out the first comment on that article. It will need to be demolished because the elevators won't work. This is all kinds of inaccurate. A NEW student accommodation tower proposed for the Adelaide CBD will give the city a global record. Hines Property has lodged a planning application for a 124.2m tall tower at 29 Twin Street between Grenfell St and Rundle Mall in the heart of the CBD. The 38-storey structure, costing $85 million, will be the tallest purpose-built student accommodation building in the world if approved, eclipsing the Student One Wharf Street tower in Brisbane that stands at 122m high. The next tallest student tower in the world is in Manchester and stands at 109m. It would be just 7.8 metres shorter than Adelaide’s current tallest building, Westpac House, and 10.8m shorter than the proposed 135m tall Adelaidean, currently under construction on Frome Street. The proposed Twin Street tower — previously reported on by The Advertiser as part of a special report into the burgeoning student accommodation market Adelaide is trying to attract — will include a range of accommodation options from single studio rooms through to five and six-bedroom apartments, incorporating a total of 510 beds. 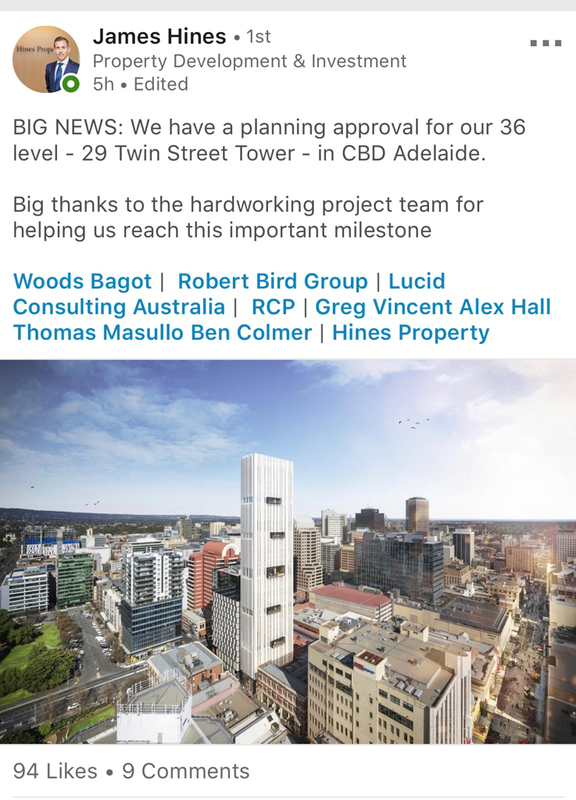 James Hines, Managing Director of Hines Property — which is responsible for several towers in Adelaide — said the 29 Twin Street project would set a new standard for student accommodation. “We’ve drawn on our extensive expertise in hotel and residential developments to design a world-class, purpose-built student accommodation tower that will be underpinned by a professional management team to ensure a safe, sophisticated and supportive environment,” he said. Hines Property planned the design of the tower with leading architecture firm Woods Bagot. Associate Principal at Woods Bagot Alex Hall said the building would include a three-level lobby void to respect the adjoining Gays Arcade while “creating a transparent, somewhat floating podium for the tower”. On top of a ground-floor lobby and cafe, the tower will also include a communal mezzanine lounge, cinema and events space, study and dining area, garden retreat and rooftop lawn, gym, wellness and yoga space. Construction of the 29 Twin Street project is anticipated to start next year and take 18 months to complete. Are there any additional renders to accompany this media PR campaign? Adelaide media has an embarrassing habit of really exaggerating the heights of our buildings. From calling 100 and 130m towers soaring skyscrapers, using photographs that make them look taller than they really are, and now calling this the tallest student accommodation in the world. It's not the tallest student accomodation in the world. It's the tallest in the known universe!! Does anyone have the plans? Oh well, it's a step forward regardless. Well there's no reason why Radelaide shouldn't dream big. Woods Baggot have done some great developments around the city, right? I have a little more hope in this turning out well.